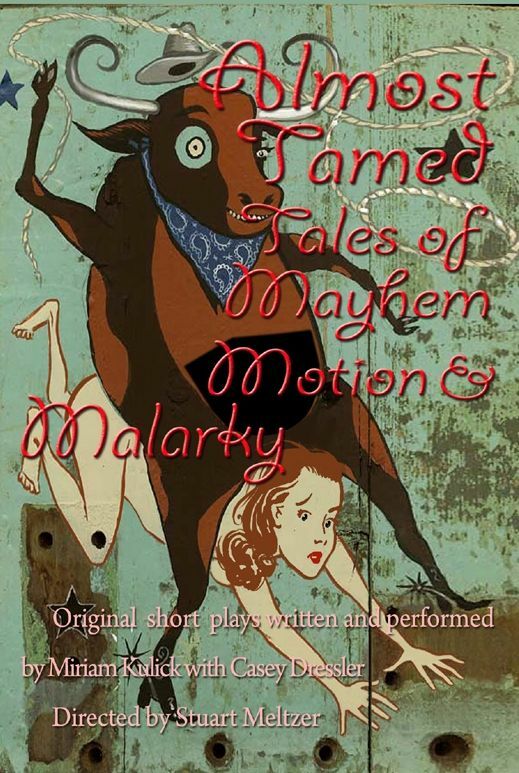 Square Peg Productions opened its production of Almost Tamed: Tales of Mayhem, Motion and Malarky, at Andrews Living Arts Studio on April 8, 2010. ...a collection of plays about women wrestling with their inner monsters. The beast is calling, it has found their numbers! Now how do a middle-aged woman and her friend answer the calls? With clarity, with conviction, or with trepidation? Who knew life could be so complicated? Well, we did, but thought we’d have fun while riding. Stuart Meltzer directed a cast that featured Miriam Kulick and Casey Dressler. Staged with effective simplicity by Stuart Meltzer in the cozy black-box space, the plays certainly give Kulick and fellow actor Casey Dressler the chance to display their considerable performing chops. But for too much of the evening, the execution is stronger than the material. To Tame is a curtain-raising monologue (or would be, if there were a curtain) about the frenzied lives of contemporary women. Yet it comes across as a free-associating riff rather than insightful commentary. The last piece, Do You Love Me Now?, is a series of increasingly frantic attempts by Kulick to whip the audience into a cheering frenzy. She dances, she mugs, she smashes a shaving-cream ``pie'' into her own face. This is a metaphor for the way some women -- maybe many -- look for approval. But it is awkward, unfunny and tedious. And at the end, in a kind of I-don't-need-you defiance, she gives the audience the finger and says ``f**k you.'' A couple of times. What a lovely, classy way to end a show. Square Peg Productions will present Almost Tamed at the Andrew Living Arts Studio through April 25, 2010.